The 30th Hong Kong Film Awards, took place Sunday evening with Tsui Hark's Tang Dynasty murder mystery Detective Dee and the Mystery of the Phantom Flame leading the way with 6 awards. The low budget action comedy Gallants was the surprise of the night, taking home 4 awards including, Best Film, Best Supporting Actor, Best Supporting Actress and Best Original Film Score. I definitely have to check that one out now. 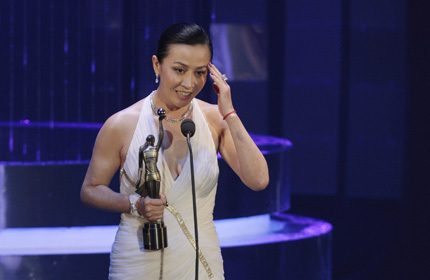 Carina Lau, accepting the Best Actress award. I see Ip Man 2 won a couple of awards as well, I was just recently thinking of watching it as well. Good work but no best foreign film apart from best Asian?